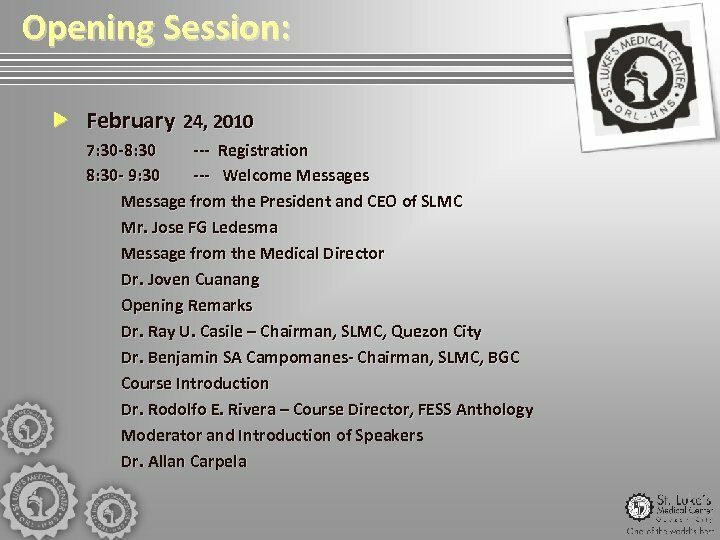 Course Program Moderators February 25, 2010 Dap Embate Raul Castillo Wendy Panganiban; Noel Ibay Francis Roasa / Gil Vicente 8: 00 – 9: 00 AM (10 mins. 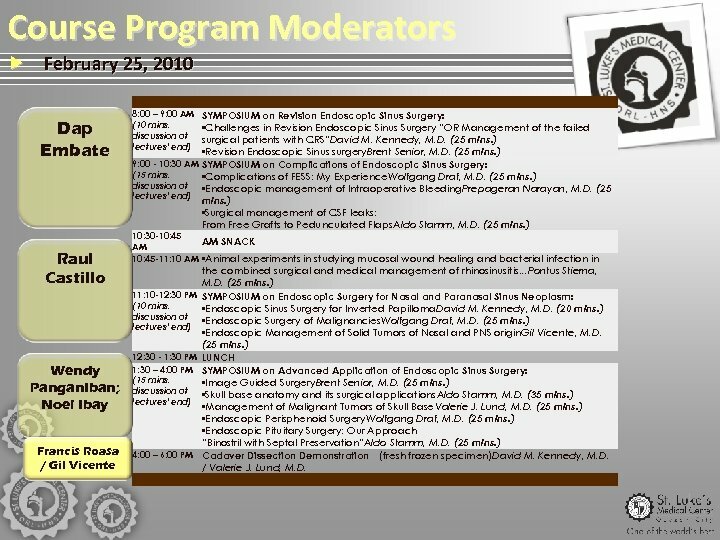 discussion at lectures' end) SYMPOSIUM on Revision Endoscopic Sinus Surgery: • Challenges in Revision Endoscopic Sinus Surgery “OR Management of the failed surgical patients with CRS”David M. Kennedy, M. D. (25 mins. ) • Revision Endoscopic Sinus surgery. Brent Senior, M. D. (25 mins. ) 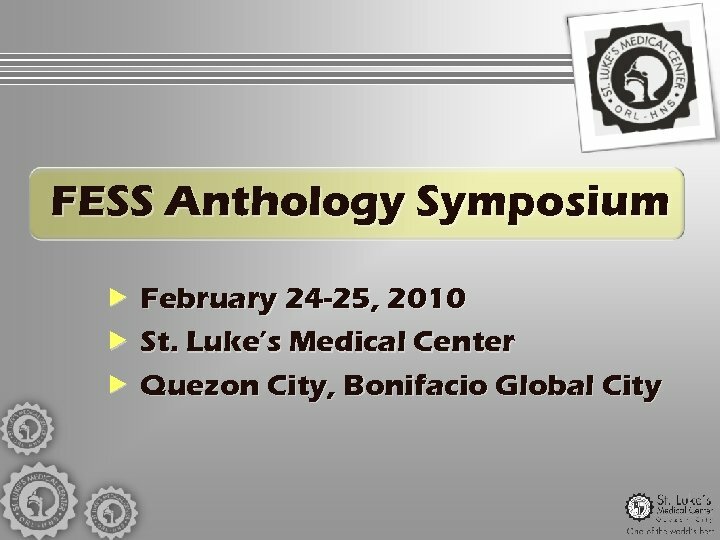 9: 00 - 10: 30 AM SYMPOSIUM on Complications of Endoscopic Sinus Surgery: (15 mins. • Complications of FESS: My Experience. Wolfgang Draf, M. D. (25 mins. ) discussion at • Endoscopic management of Intraoperative Bleeding. Prepageran Narayan, M. D. (25 lectures' end) mins. ) • Surgical management of CSF leaks: From Free Grafts to Pedunculated Flaps. Aldo Stamm, M. D. (25 mins. ) 10: 30 -10: 45 AM SNACK AM 10: 45 -11: 10 AM • Animal experiments in studying mucosal wound healing and bacterial infection in the combined surgical and medical management of rhinosinusitis. . . Pontus Stierna, M. D. (25 mins. ) 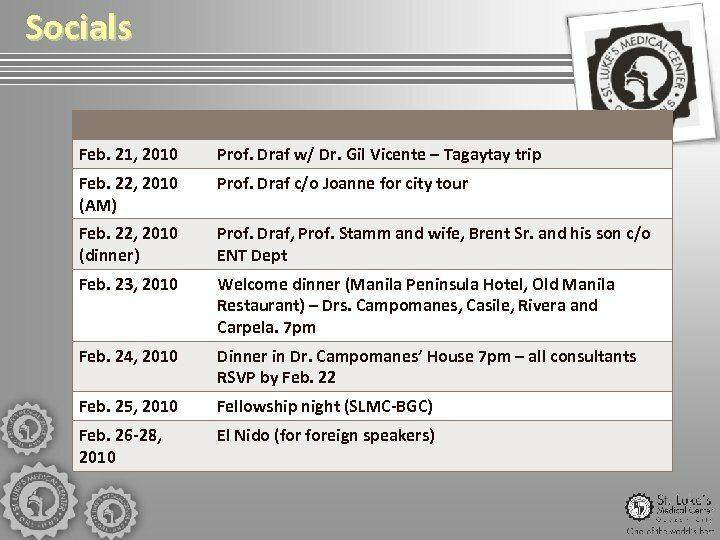 11: 10 -12: 30 PM SYMPOSIUM on Endoscopic Surgery for Nasal and Paranasal Sinus Neoplasm: (10 mins. • Endoscopic Sinus Surgery for Inverted Papilloma. David M. Kennedy, M. D. (20 mins. ) discussion at • Endoscopic Surgery of Malignancies. Wolfgang Draf, M. D. (25 mins. ) lectures' end) • Endoscopic Management of Solid Tumors of Nasal and PNS origin. Gil Vicente, M. D. (25 mins. ) 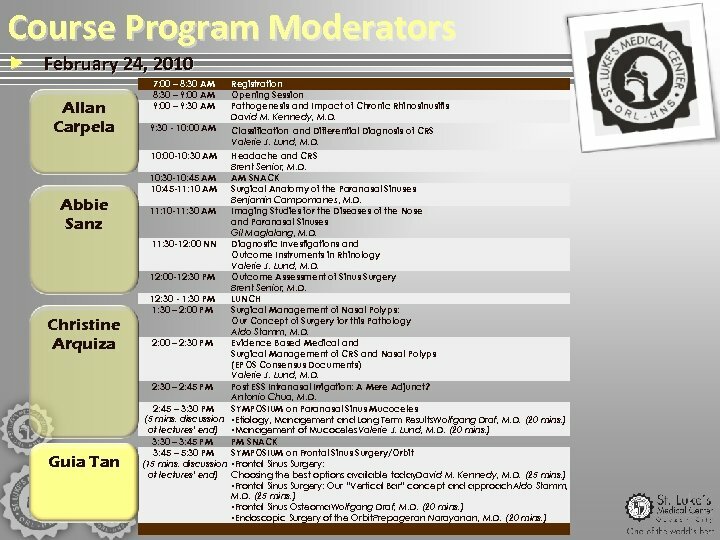 12: 30 - 1: 30 PM LUNCH 1: 30 – 4: 00 PM SYMPOSIUM on Advanced Application of Endoscopic Sinus Surgery: (15 mins. • Image Guided Surgery. Brent Senior, M. D. (25 mins. ) discussion at • Skull base anatomy and its surgical applications. Aldo Stamm, M. D. (35 mins. ) lectures' end) • Management of Malignant Tumors of Skull Base. Valerie J. Lund, M. D. (25 mins. ) • Endoscopic Perisphenoid Surgery. Wolfgang Draf, M. D. (25 mins. ) • Endoscopic Pituitary Surgery: Our Approach “Binostril with Septal Preservation”Aldo Stamm, M. D. (25 mins. ) 4: 00 – 6: 00 PM Cadaver Dissection Demonstration (fresh frozen specimen)David M. Kennedy, M. D. / Valerie J. Lund, M. D.